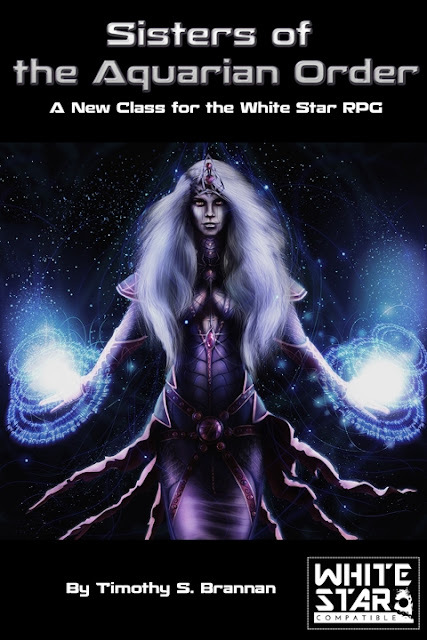 A new class for the White Star RPG. The Sisterhood of the Aquarian Order is a class human mystics that have guided humanity towards the stars for centuries untold. In ancient times when mankind was still battling over feudal lands, the Order was plotting the motions of the planets. When humanity was first using solid fuel rockets the Order was projecting their consciousness beyond our solar system into the stars. When humans first set foot on alien words, the Order already knew the songs of these Aliens. Now that humans have taken their rightful place among the stars the Order does what it can to keep humanity moving forward. To what future, only they know. They believe that humanity is on the cusp of a new consciousness and a new age. Details on the Capricorn Heresies and the future of the Order. Now available in both PDF and Print!